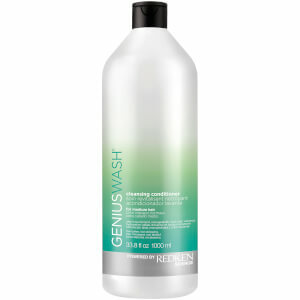 The Redken Genius Wash for Medium Hair is an advanced treatment to provide additional, targeted care for your specific hair type. Ideal for dry and thinning hair, the co-wash cleansing conditioner has a gentle, low lather formula that sweeps away dirt and impurities while infusing hair with essential nutrients. Acting as a two-in-one treatment with conditioning Apricot Oil and strengthening Soy Proteins, it enhances manageability, optimizes moisture levels and protects color vitality for locks that smooth, shiny and softened. Aqua/Water, Cetearyl Alcohol, Sodium Cocoamphopropionate, Hydroxypropyl Starch Phosphate, Behentrimonium Chloride, Parfum/Fragrance, Coco-Betaine, Caprylyl Glycol, Isopropyl Alcohol, Glycerin, Menthol, Sodium Chloride, Prunus Armeniaca Kernel Oil/Apricot Kernel Oil, Hydrolyzed Soy Protein, Tocopherol, Hydroxypropyltrimonium Hydrolyzed Wheat Protein, Phenoxyethanol.